DESCRIPTION Table lamp available in 2 sizes highlighted by a unique, Murano glass diffuser in frosted white and crystal. 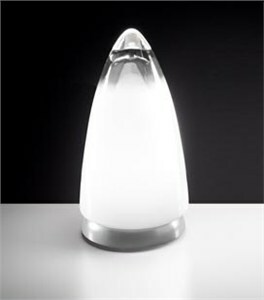 The beauty of the glass diffuser is set off by crisp incandescent illumination. Companion floor, ceiling, wall and pendant designs also available. CONSTRUCTION A circular, painted titanium base secures the hand-blown diffuser in place with 3 set screws. The black cord that exits the base contains an on/off switch. LIGHT SOURCE 1 x 60 watts, incandescent, G-16, medium base (provided). GLASS COLOR Smoked White and Clear Crystal.